Oven Baked Macaroni and Feta Cheese – Everyone’s favorite mac ‘n cheese made BETTER! Everything is betta with Feta! I KNOW! Please don’t roll your eyes!! Or worse, yet, walk away! Are you tired of the same old mac ‘n cheese? 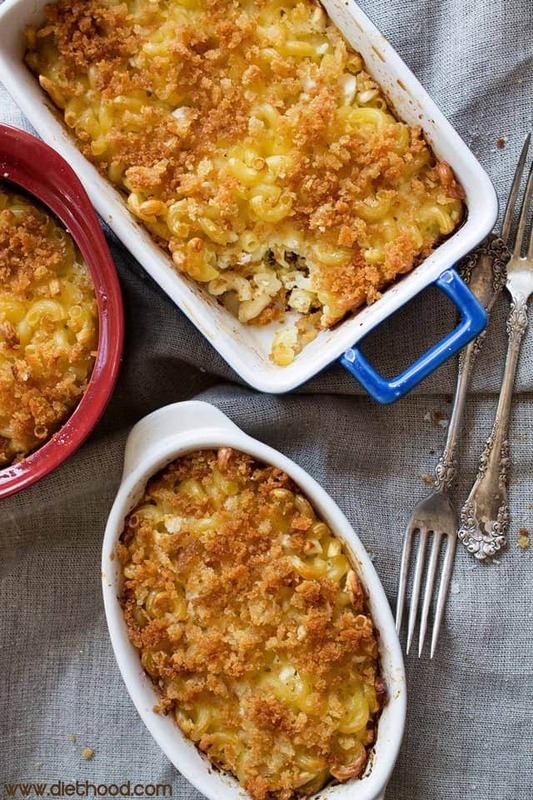 Have you been dreaming about baked macaroni with … ummm … a different kind of cheese? 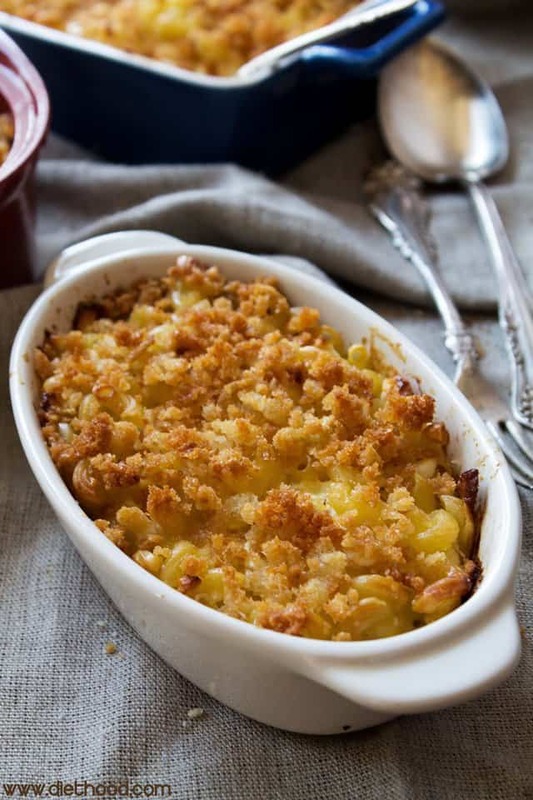 Do you often think about adding a crunchy topping to your mac ‘n cheese? You didn’t see that one comin’, did ya! Yeah, I threw some fried bread crumbs on top – that’s some goooood stuff! Growing up, we used to eat this stuff all.the.time. Oven Baked Macaroni and Feta Cheese was on mom’s menu about every other week. This stuff is great. One pot + 4 forks = 1 happy family. Okay, so, technically it’s a baking dish, not a pot, but, “One baking dish + 4 forks” didn’t look right. I told my mom I was going to post this macaroni dish on my blog, and the first thing out of her mouth was, “Don’t go throwing in all them things that you like to throw into our food … give them the real recipe!”. She says I tweak “our” recipes too much. Our, as in Macedonian recipes. I “tweak” because most of our recipes stop at salt and pepper. It’s very rare that you will see an herb in a Macedonian recipe. Garlic, onions, and parsley. That’s it. The buck stops there. I blame it all on Vegeta Food Seasoning. So for the sake of keepin’ it real, I am going to give you the recipe as is – no tweaking. Minus Vegeta. Now you know there’s, like, nothing to this meal, right? It’s just some cooked macaroni swimming in custard with a sprinkle of feta. Aaaand some crunchy stuff on top. Easy peasy. Give it a try. You might love it as much as I do. 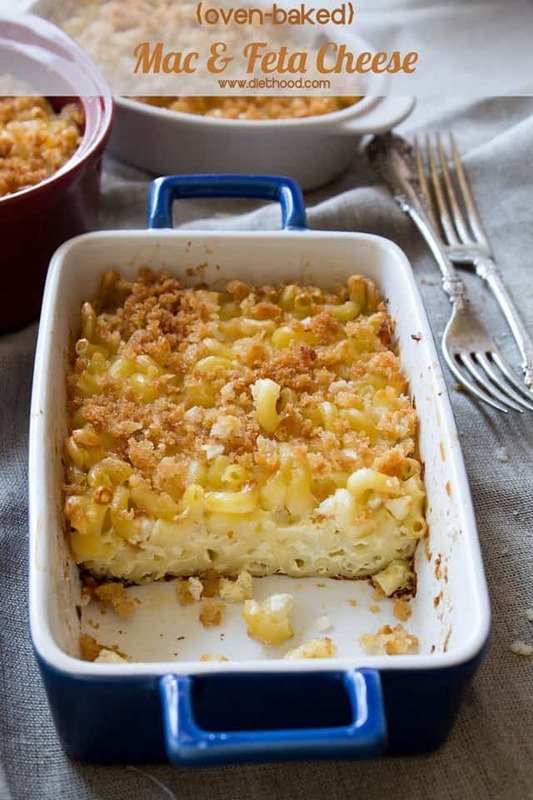 Oven baked macaroni made with a mixture of eggs, milk, and feta cheese, garnished with a crispy crumb topping. Cook the macaroni in salted water. Drain. Generously butter a 13-by-9-inch glass baking dish. Pour cooked macaroni into baking dish and toss with 1 tablespoon olive oil. Mix in crumbled feta cheese. In a medium mixing bowl, whisk together the eggs, milk, salt, and pepper. Pour the egg mixture over the macaroni; mixture should come about 3/4 of the way up - it shouldn't cover the macaroni. Add the fresh bread crumbs to the pan and cook over medium-high heat, stirring frequently, until browned. Remove from heat and spread the bread crumbs over the macaroni. Bake for 40 to 45 minutes, or until the custard sets and edges are browned. My baba made this with spaghetti noodles and used to cut it up in squares. She didn’t use the bread crumbs but that’s a nice touch! I agree we need to tweak the recipes! I think it was traditionally because of the lack of available ingredients. Just found this recipe today and made it. it is delicious! I only baked it for 30 min or so, so it was very moist. I added some cooked broccoli and used sun dried tomato feta cheese. The bread crumbs were nice and crunchy. Will be making this again. So easy and simple. I love the flavor of feta cheese and how great it is when i find out your recipes. Why don’t you give more illustration photos or video to show everyone how this delicious dish is made? Flavor good but a little dry! Any suggestions for next time? This is so easy to make GF! I used GF penne and panko gf breadcrumbs. I also had leftover turkey, onion, and broccoli to add as well. It’s a one-pot meal! Hi Katerina! I just came across your site while looking for a mac’n’cheese dish that uses feta. My partner is Greek and I am half roumanian so there is ALWAYS some feta or bryndsa in our fridge. I want to halve your recipe though — how should I split the 5 eggs? Can I just use 3? (I have large free-range eggs) Thanks! That is awesome!! 🙂 Let me know if you enjoyed it! Even my dish turned out quite dry … quite a bit leftover … Any way to fix it or any recipe on what to do with the leftovers??? Love love love! Want some! This is perfect mac n cheese Kate. I only need goat cheese to make me happy. Love it´s simplicity! You mom was right! OH MY great mac and cheese recipe! One of my fave comfort dishes, and i like that you added feta! This sounds absolutely amazing! I am definitely pinning this! Just wanted to let you know that I’m following all of your social networks and via bloglovin’ :o) Have a great day! Who doesn’t love mac n cheese? Will have to try feta sometime; it sounds really good. I add bread crumbs to mine, too–the crunch is needed to balance out that creaminess for the perfect bite. Now I want this for breakfast. I’ve seen cooks make mac and cheese with blue cheese, and other cheeses, but never with feta. Perfect timing for me – I just bought a huge container of it from Costco! What, walk away? I want to walk right into this! I need a comfort food… I haven’t eaten much lately but I can always eat delicious mac and cheese. Sounds wonderful~~! This macaroni and cheese looks like heaven! Love your Macedonian take on an American dish! Wow, Kate, that looks so yummy. I love feta cheese in so many things, but I’ve never tried it in mac and cheese. What’s so awful about Vegeta? Somewhere around the 1970’s Vegeta took over Macedonian kitchens, and people stopped using herbs … Vegeta is like the substitute for everything. But, thyme and rosemary are slowly coming back, so there’s hope!! I, personally don’t like the taste of it, but as I said, I also don’t like it because home cooks stopped using fresh herbs. I don’t think I could ever ever tire of feta recipes! I’ve never used it in mac and cheese before though…GENIUS idea! Pretty much any dish you want to add feta to is ok by me! Feta sounds like a great cheese for mac & cheese and I never get tired of recipes with feta! This looks like another great comfort food! have a great weekend! I’m always looking for great mac & cheese recipes! This looks great! Like you, I grew up in a household (Romanian from Yugoslavia) where salt and pepper, and occasionally paprika, were the only spices used. Parsley and very rarely dill were the herbs. Great dish meant for someone with a hearty appetite. Walk away from Feta? Never! I always buy the great big container of Feta at Costco and I’m always looking for new ways to use it. This looks SO good! This is brilliant, girl! Bring on the feta! Keep the feta recipes coming. I’m loving all of them and this pasta dish looks great with the crumbs on top. Hahaha…I know what you mean! My MIL can’t cook without vegeta LOL! On the other hand I stopped using it almost a year ago..well sometimes I added it but that is very rare. 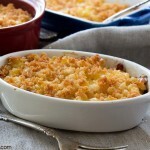 I love baked mac&cheese plus feta…how yummy that is! LOVE IT! Oh you make me laugh Kate! So true with the “Vegeta” line. It has got to be the number one thing in any Macedonian pantry. It pretty much goes into every savoury dish I know. My sister-in-laws mother (yes Macedonian) rubs it into chicken pieces when doing a BBQ. You know, I am so anti Vegeta that it drives my family crazy!